When you’re on your epic road trip of New Zealand part of the adventure often involves taking the Cook Strait Car Ferry from Wellington to Picton as the journey goes from the North to the South Island (or vice versa). Upon arriving in Picton, many people continue on without stopping to take a look around first. It’s such a shame as there are so many great things to do in Picton and our blog below highlights 9 of the best! If you’re from overseas you may not know that Picton is the gateway to the Marlborough Sounds, a stunning and unique natural wonder that is a collection of sunken river valleys and inlets. One of the more novel ways to explore it is as a passenger on the Marlborough Sounds Mail Boat Cruise. Run by the crew at Beachcomber Cruises, it is in actual fact, a proper mail boat that goes to locations in the Sounds inaccessible by road. It’s a great chance to meet locals on the route on a public service while enjoying the views too! Another great way of exploring the Marlborough Sounds is with a paddle in hand in a Sea Kayak. 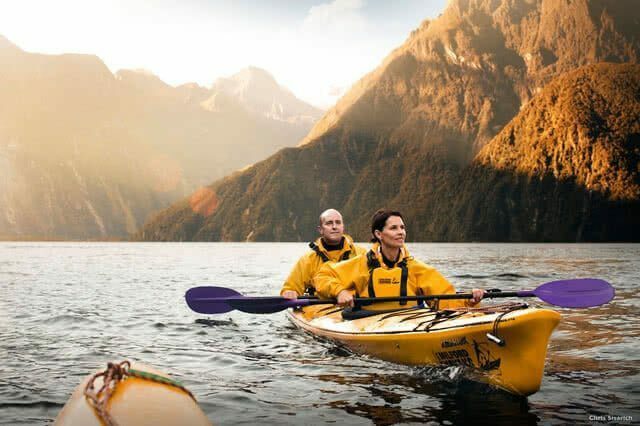 You can do this yourself via a rental or you can join a half or a full day guided tour with the likes of the Marlborough Sounds Adventure Company. This is a great option to consider because the expert guides have put together a great route and will take to all the best spots that only the locals know about! If you’re more of a land-lover then that isn’t a problem as there are plenty of places to stretch your legs including the Queen Charlotte Track. The Queen Charlotte Track is one of the most exquisite coastal walks in the country with amazing views across the Marlborough Sounds. In its complete form, it’s actually a multi-day hike (3-4 days) with Department of Conservation campsites and private accommodation available. You can also do it as a day trip however to Queen Charlotte Sound, a picturesque sound of the Marlborough Sounds. The Queen Charlotte Track, along with others in the region, provides great opportunities for mountain biking. Mountain biking is one of the great recreational pursuits in New Zealand and we’ve got tracks and terrain that attract people from across the globe. Wilderness Guides are a trusted local company you can hire from and they also do single and multi-day tours. If you’re up for that kind of challenge then you should definitely add this to your list! So far we’ve focused on the spectacular Sounds (with good reason) but there are plenty of things to do in Picton itself! One such example is the Edwin Fox Maritime Museum, home to the legendary Edwin Fox, the 9th oldest ship in the world. The 161 year old former merchant and convict ship is an ongoing restoration project which is equally impressive as it sounds. You’ll be able to see it in the flesh and learn about its vast and fascinating history. Another great local museum to add to your list of things to do in Picton is the Picton Heritage and Whaling Museum. The museum has been an ever-present feature of Picton for over 60 years and chronicles the history of the land and its people. There’s also a big focus on its former industry of whaling with thousands of items and artefacts to see and interact with. Very much led by the community and a good one to support! Not far from the Picton Ferry exists a wonderful sanctuary where you can experience some incredible wildlife. The Kaipupu Wildlife Sanctuary is what we’re talking about and is one of the highest rated attractions in Picton. It’s another fantastic community-led project with a predator-free fence that has allowed native species like Tui, Korimako, Keruru (NZ Wood Pigeon), Karearea (NZ Falcon), Kekeno (NZ Fur Seal) and more to flourish. You can only get there by water taxi, kayak or by one of the many water taxis in Picton. Picton offers another great wildlife experience at the EcoWorld Aquarium & Wildlife Rehabilitation Centre. EcoWorld is an interactive and fun place to spend a morning or afternoon and is especially popular with the kids. You’ll be able to have close encounters with Blue Penguins, Tuatara, Giant Weta, Seahorses, Kakariki and more. They even have a preserved Giant Squid (not recommended for the squeamish). Open 7 days a week and a great one to make time for. Picton also has the virtue of being on the doorstep of one of the most renowned wine regions in the country. The Marlborough Region is famous throughout the world for its superb wines (especially its Sauvignon Blanc) and you can sample the best of these by booking yourself on a wine tour. The great team at Sounds Connection do an awesome job with this having worked with the local wine industry for over 20 years. You’ll learn all about the different varietals, winemaking processes, tasting notes, food pairings etc for a fantastic all round experience. Fantastic things to do in Picton! As you can see, there are plenty of things to do in Picton to keep you entertained for a good day out or more! As we mentioned previously, the car ferry from Wellington – Picton is a great service and makes it super easy for you to hit the ground running in your rental as soon as you get there. With no excuses not to, be sure to make plans for it today! Enjoy the mind blowing views of turquoise oceans and snow capped mountains right at the center of New Zealand. Get Up Here. It's Epic! Select ENQUIRE NOW or call number below, quote GO Play to confirm booking. Present GO Play Card on arrival.